Angel at Rose Hall - Blog: Eureka Springs the Coolest Small Town in America? 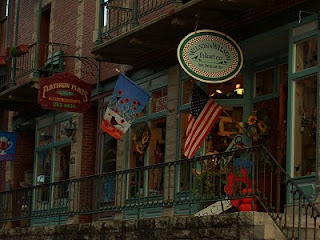 Eureka Springs the Coolest Small Town in America? What a great surprise, I jsut discovered the Eureka Springs has been selected to be the "Coolest Small Town in America." Eureka Springs has been selected from 80 nominated small towns in America.According to Budget Travel Magazine " we're looking for towns with a little bit of an edge, more avant-garde than quaint." Well, I think that decribes Eureka Springs perfectly. No, traffic lights, little to no crime, great walkable downtown area and a population under 10,000. The Art Galleries and wonderful shopping is just an extra bonus. So, go and VOTE for Eureka Springs. The Angel at Rose Hall is proud to be a part of this wonderful, magical paradise know to some as the ExtraOrdinary Getaway.